Music is one of the few forms entertainment that has remained a significant part of peoples’ daily lives for thousands of years. More than just entertainment, music is an art form, an important medium for cultural exchange, and in more recent times, a major business industry. The demand for music consumption has created a multi-billion-dollar industry encompassing production, distribution, publishing, live concerts, album sales, streaming, and other music related activities. The music industry generated around 51.5 billion U.S. dollars globally in 2018, with around 19.6 billion of that coming from the U.S. alone. Forecasts predict slow but steady growth in the coming years, with U.S. based revenues expected to increase to around 22.6 billion dollars by the year 2021. The biggest players in the music industry aren’t the artists themselves, but the distributors, many of which have grown into massive billion-dollar companies. After its purchase of EMI in 2013, Universal Music Group has become the most successful music distributor in the industry, having sold over 115 million albums and generated 5.67 billion Euros in revenue in 2017 alone. Sony Music and Warner music group are the two other major distributors in the industry. Together, these three companies account for 82 percent of total music album consumption in the United States. 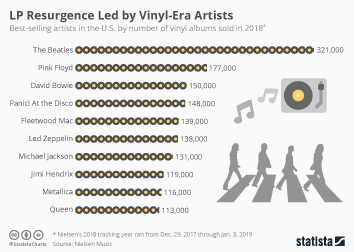 For comparison, only one other distributor (TuneCore, Inc.) accounted for over 7 million album sales in 2017, showing the massive amount of power that has been consolidated between the music industry’s 'Big Three'. In addition to the distributors, record labels also play a major role in the marketing and sometimes publishing of music. Interscope, RCA, Atlantic, and Columbia are some of the biggest, all of which are subsidiary companies of one of the 'Big Three' distributors. While most distributors have been quick to transition to digital and streaming music in recent years, one aspect of ‘physical’ music remains absolutely crucial regardless of technology changes: live music. Concerts, festivals, club events, and live performances continue to attract audiences and encourage further growth in the industry. Between sponsorship revenues and ticket sales, the live music industry in the United States is expected to amass over 10 billion dollars in revenue in 2018. Live music creates the need for another branch of music companies who can provide services such as promotion and ticket selling. Live Nation, one of the biggest of these companies, promoted nearly 30 thousand events in 2017 and generated revenues of 7.89 billion U.S. dollars. Ultimately, the music industry in the U.S. remains strong and despite significant changes in the industry since its heyday, there is still potential for growth. Recorded music revenue has hovered between 4.6 and 4.9 billion U.S. dollars since 2009, however in 2017 revenues surged to 5.9 billion, a significant increase on previous years. Whilst just 87.6 million physical albums were sold in the U.S. in 2017, the increased demand for digital music has meant that streaming revenue has grown exponentially, amounting to 5.7 billion U.S. dollars in 2017. This marks a dramatic upward spike from the 4 billion dollars recorded in 2016, and looking at the consistent increase in streaming revenue since 2010, these figures are unlikely to show any signs of decline. Looking to the future, brands and consumers can expect the music industry in the United States to become increasingly more reliant on revenue from digital channels. Topic: Radio in the U.S.
Topic: Digital music in the U.S.